Between the years 1831 and 1838 the forced removal of 132,000 people of the Five Civilized Tribes from the American deep south to Oklahoma resulted in the deaths of over 60,000 people. From start to finish this government “relocation” plan caused massive suffering and a huge loss of life and came to be called “The Trail of Tears”. Although there is no real comparison to that level of pain or suffering, I believe that many of us are on our own “Trail of Fears”. I am speaking of fear in its most subtle form not the obvious meaning of fear. The fear I am talking about wears many disguises: in its most aggressive form it shows up as anger, greed, jealousy, insecurity, shyness, anxiety. And it also shows its face in its offspring: eating disorders, excessive drinking, drugs, rage, and sexual addiction. But there is a more insidious facet of fear, a deeper fear that shapes your actions, responses and choices. 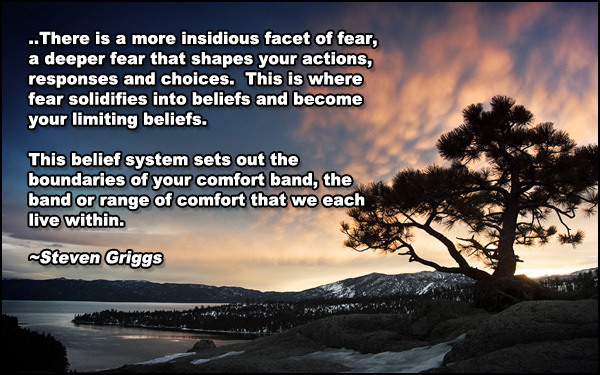 This is where fear solidifies into beliefs and become your limiting beliefs. This belief system sets out the boundaries of your comfort band, the band or range of comfort that we each live within. It acts like a thermostat setting. You never go lower than the low setting or higher than the high setting. You hover just in between. For example, you may be on the verge of being “very successful” but never quite making it. But you never drop too low to slip into the “less than successful range” or loser range. You know, you make good money but not a million dollars a year. Your home is great but not too great. Your car is good but not too good. Do you see what I mean? Look at yourself. Do you see your settings? Be honest with yourself and really look at your settings. Do you see your lower setting? Do you see your high setting? I think it is easier to identify your lower setting because it will likely be more consistent. It will act like a plateau and you always stay just above it. I think it can be trickier seeing your higher setting because you may have been working very hard towards being successful and there may be peaks and dips but over a longer period of time you will see the pattern. I speak from experience. That is me I am describing above. You also have to remember that this is a relative thing. My idea of success may be much different than yours and vice versa. Another thing to remember is that things change. Although understanding your comfort band is important it may prove to be a moving target because as you learn more about yourself you may find the hunger you once had for some forms of success has lessened. You may see that things have changed and that is the exciting part.